In June last year I interviewed Dr. Andrew Mackintosh, who leads the Climate Models group of ANZICE, about the cutting-edge glacial modeling work being carried out by the Antarctic Research Centre at Victoria University of Wellington. 12,000 km across the Pacific Ocean, the Climate Modeling Group at the University of Victoria in British Columbia is hard at work on similar research. Bridging the watery gap between these two Victorias is the work of a young modeler called Jeremy Fyke. In his PhD research, Jeremy is simulating climate / ice sheet interactions for Greenland using a coupled climate and ice sheet computer model (UVic Earth System Climate Model). In ‘equilibrium simulations’ the model can be forced with various fixed atmospheric carbon dioxide concentrations, usually defined as multiples of the preindustrial CO2 level (~280 ppm by volume). For any given atmospheric CO2 concentration, the ice sheet can have multiple steady states, depending on the initial ice sheet conditions (i.e. full preindustrial ice extent, depleted ice or ice-free). So an existing ice sheet might change to a stable, but diminished state under elevated CO2, but an ice-free Greenland would not be able to grow a similarly sized ice sheet from scratch in an identical atmosphere: the resulting ice sheet could be very small or non-existent. This highlights the importance of feedbacks in the climate / ice sheet system: an existing ice sheet has a size, shape and surface character (e.g. albedo) that can begin to dictate its own climate setting, which is generally favorable to its continued growth or stability. Jeremy’s work has shown that the Greenland Ice Sheet has been self-sustaining throughout the Holocene. The other main aspect of Jeremy’s work has been modeling the deglaciation of Greenland under transient emissions scenarios, starting from a stable preindustrial state. There appears to be a threshold for a large-scale collapse (>75% ice loss) of the Greenland Ice Sheet at around three to four times preindustrial CO2. Interestingly, though, the transient scenarios do allow for a temporary exceeding of this threshold due to the long response time of the ice sheet in Jeremy’s model (good news for a society that is unlikely to change its habits overnight). The slow response of the simulated ice sheet is thought to be related to the model’s low polar amplification of global climate signals. However, even with what are likely to be conservatively low estimates of ice sheet change, the model suggests that at around five times preindustrial atmospheric CO2 there would be no remaining ice on Greenland. That equates to ~7 m of global sea level rise. Forced by an atmosphere that currently has 1.4 times the background Quaternary interglacial CO2 concentration, the Greenland Ice Sheet is already showing signs of deglaciation, and anthropogenic greenhouse gas emissions are likely to inhibit the natural inception of future North American ice sheets. Jeremy’s research is also shedding new light on the little-known long-term glacial history of the Greenland Ice Sheet. Records of ice-rafted debris in the North Atlantic have been interpreted as evidence for a continental-scale ice sheet as far back as the Oligocene or even Eocene. 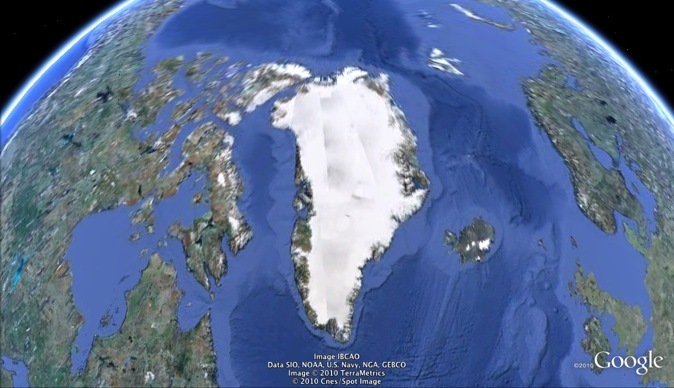 However, Jeremy’s results show that even a small localised ice cap centered on the mountains of Greenland’s southeast coast would be able to coalesce at four times preindustrial CO2 and discharge ice to sea level. This suggests that the expansive ice sheet that we see today could be a much more recent addition to the cryosphere than some have previously thought. Modeling of this kind is very computationally expensive. Each simulation in this study typically requires a month of non-stop computer processing time. With around 60 ‘runs’ in total, Jeremy’s study has had the CPU working steadily for around four years now, with more runs waiting in the queue. Yet models exist that are orders of magnitude more complex still, such as many of those utilised by IPCC forecasters. With greater processing power comes the ability to run scenarios at increasingly fine temporal and spatial resolutions and therefore (hopefully) to replicate the ‘real world’ systems more accurately. It is important, therefore, to bear in mind that Jeremy’s work is subject to the limitations inherent to modeling and that the results are highly model-specific. Comparing the results of different models is however an important scientific opportunity in itself: cross-examination between modeling studies can help sort those results that are merely artifacts of particular model physics from those that are systemic in the real world. 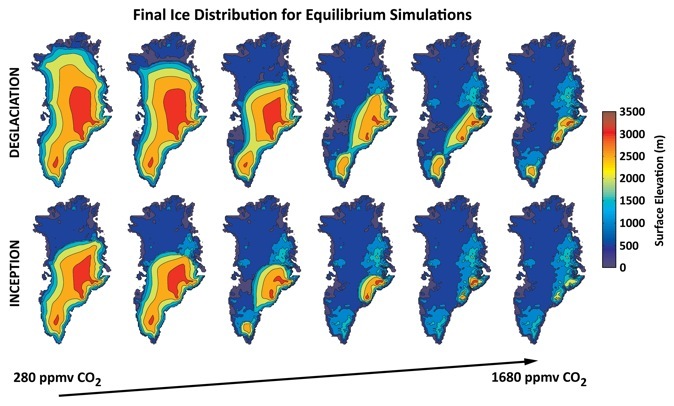 The history and future of the Greenland Ice Sheet remain shrouded in uncertainty, but by seeking to understand the climate / ice sheet system at a fundamental level, modelers like Jeremy are now able to simulate past glacial fluctuations and explore the potential range of future ice sheet configurations. Whether the future of the Greenland Ice Sheet is defined by regained stability, partial deglaciation and regrowth, or large-scale deglaciation is really up to us: will we be able to wean ourselves off fossil fuels in time? Figure modified from Fyke et al (in prep). Satellite image (c) 2010 Google Earth. This research was made possible by the supervision of Dr. Andrew J. Weaver (School of Earth and Ocean Sciences, University of Victoria), Dr. Andrew Mackintosh (ARC) and Dr. Lionel Carter (ARC).